The Karelians call themselves karjalaised, karjalazed, livviköid, lüüdiköid. 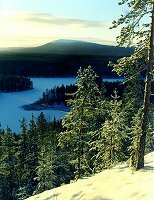 In the Scandinavian sources the name Karelia has occurred since the 8th century; the Karelians were first mentioned in the Russian sources in 1143. The Karelians live in their original territory in the Republic of Karelia of the Russian Federation (172,400 sq. km., capital city Petrozavodsk, in Finnish Petroskoi) and dispersed in many other places in Russia (including, as small communities, in the provinces of Tver, Novgorod, Petrograd, and Murmansk), in Finland and Sweden. The number of people speaking Karelian began to decrease at the beginning of the 20th century, but the assimilation of Karelians has become critical during the Soviet period, owing to massive immigration of Russians, Ukrainians and Byelorussians to Karelia. In the national Republic of Karelia the ratio of Karelians who can speak their native language is 51.5%. Around 1710, tsar Peter the Great of Russia decided to take control of Finland as a way of giving Russia an outlet on the Baltic Sea. By 1716, he had gained his opening on the Baltic Sea, and by 1721, Russia controlled most of Karelia. The struggle for control over the rest of Finland raged on and off throughout the 18th c. At the conclusion of the Russo-Swedish war in 1809, Finland was ceded to Russia. Finnish nationalism had been increasing already under the Swedish rule, but grew strongly under the Russians, as a reaction to russification policies. When the Soviets withdrew from World War I in the wake of the 1917 revolution, Finland declared itself independent with full support of the Allied Powers. The Finland of between the wars included parts of present-day Karelia, namely the Karelian isthmus, and the western shore of Lake Ladoga. The Karelian Labour Commune was formed in 1920, with Finnish as the language of administration and education, in accordance with the Tartu peace agreement. In 1923, Karelia's status was changed to autonomous republic within the USSR - the Karelian ASSR. In the inter-war period, the area was dominated politically by Finnish Communists who had fled to the Karelian Labour commune after Communist lost in the Finnish Civil war in 1918. They recruited communist Finns from diaspora communities in Canada and the United states to come and build socialism in Karelia. By the 1930s, Karelia was dominantly Finnish/Karelian. Stalin began a ruthless purge of Karelian leaders in 1935. By 1938, every trace of Finnish was banned within the Karelian ASSR, and Latin script had been replaced by Cyrillic. 1939 - Elimination of the Tver-Karelian National District; the Karelian-language writings are destroyed. When the Soviet Union went to war and invaded Finland in 1939, Finns and Karelians resisted the aggression. After several months of heroic fighting, they gave in in March 1940. The Soviet Union took back the Karelian isthmus and the western shore of Lake Ladoga, and created the Karelo-Finnish ASSR. The Finns joined the Germans against the Soviet Union in 1941, and liberated Russian-occupied Karelia until 1944. During the Finnish occupation, Finnish was the official language, and remained so also when the Soviets took Karelia back, although publications in Finnish were discouraged. In 1956, the Karelo-Finnish Soviet Socialist Republic was dissolved and replaced again by the Karelian ASSR. Since then, Karelians have been undergoing a rapid assimilation process with the neighbouring Russian community. In 1990, a group calling itself the Karelian republic declared autonomy within the Soviet Union. and in 1991 changed the name to Republic of Karelia. Karelian and Veps were declared official languages. The vast majority of Karelians are bilingual (Karelian and Russian), about 50 percent use Karelian as their native language (1989). Karelian writers write in both Russian and Finnish. In recent years measures have been taken to help revive the national culture. The Karelians constituted only 10% of the population of Karelia according to the 1989 census. The inner national unity of the Karelians has slackened. Based on the census of 1989, 47.9% of the Karelians in the Soviet Union indicated their mother tongue to be Karelian, 45.5% Russian, and 6.6% some other language; in the whole Russian Federation the numbers were 48.6%, 46.3%, and 5.1%, respectively. 40% of the Karelians who live in cities, 50% of those living in industrial settlements and 64.6% of rural Karelians consider Karelian their mother tongue. The assimilation of the language is most extensive in the cities of Karelia, because there the communication between the generations in Karelian is almost non-existent. 70% of rural Karelians are living in areas where the assimilation of their language has been less rapid. Rural Karelians are the Karelians’ hope of survival as a nation, but the hopes should be supported by an efficacious national policy, including the creation of circumstances for the proper functioning of the spoken and written Karelian language.